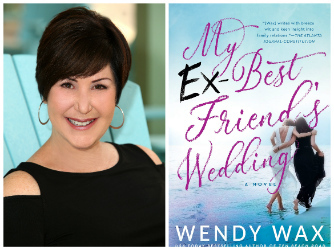 USA Today bestselling author Wendy Wax returns to Copperfish Books to talk about her new novel My Ex-Best Friend's Wedding, on May 20 at 6 pm. After her talk, Wendy will be happy to sign copies of her books. To reserve a seat, call 941-205-2560 or email copperfishbooks@comcast.net. My Ex-Best Friend's Wedding is Wendy's ninth standalone novel. Synopsis: A wedding dress passed down through generations unravels the tangled threads of three women’s lives in a novel of friendship, family, and forgiveness. Wendy’s contemporary women’s fiction explores friendship, loyalty, self-discovery and the seemingly insurmountable challenges life sometimes presents. Her previous novels – A Week at the Lake, While We Were Watching Downton Abbey and her Ten Beach Road novels (Best Beach Ever, One Good Thing, Sunshine Beach, The House on Mermaid Point, Ocean Beach and Ten Beach Road) – have been featured in national media such as USA Today, Ladies’ Home Journal, CNN Online, and Woman’s World. Born in St. Petersburg, Florida, she grew up on St. Pete Beach within spitting distance of the Gulf of Mexico. A former broadcaster and the mother of two grown sons, Wendy lives in Atlanta with her husband where she’s traded in her picket fence and gardening gloves for hi-rise living and a desk with a view from the 37th floor. Read more about Wendy Wax and her books on her website.